Durango’s Payson McElveen, left, rode with focus and skill all day en route to the marathon mountain biking national championship Sunday in Arkansas. Durango’s Payson McElveen, middle, won a sprint to the finish line with fellow Durangoan Howard Grotts, left, to win the USA Cycling Marathon Mountain Bike National Championship in Arkadelphia, Arkansas. Jeremiah Bishop of Georgia was third. Howard Grotts knew one of his stiffest competitors would be one of his best friends. But not even that friend thought he could win a national championship so soon in his professional career. Payson McElveen, a Fort Lewis College alum and defending Iron Horse Bicycle Classic road race champion, earned the biggest win of his life Sunday. 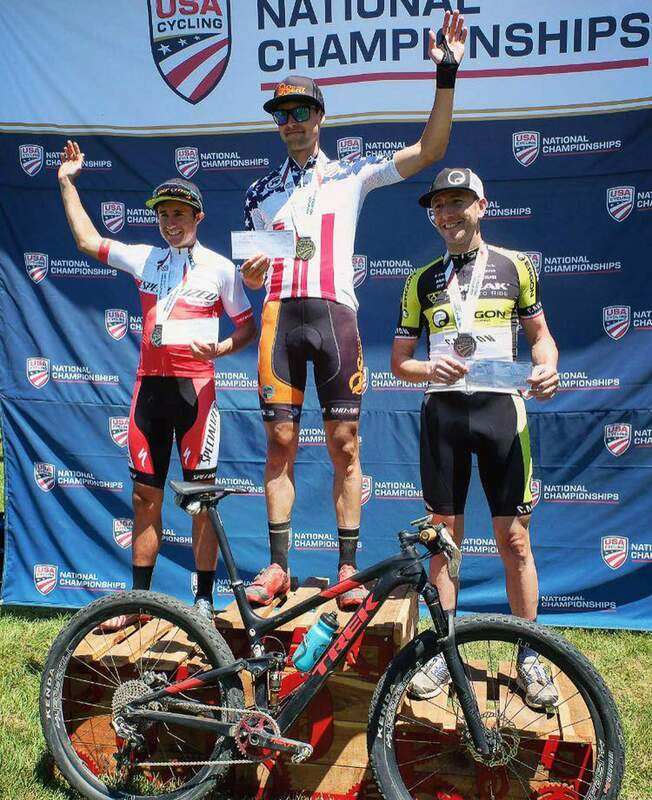 He beat Grotts, a 2016 Olympian and Durango native, in a sprint to the finish line at the USA Cycling Marathon Mountain Bike National Championships in Arkadelphia, Arkansas. McElveen, who originally is from Austin, Texas, completed the roughly 50 miles in 3 hours, 16 minutes, 47 seconds to win his first national championship and stars and stripes jersey that comes with the victory. Grotts was second in the same time. Jeremiah Bishop of Augusta, Georgia, placed third in 3:21:02, Utah’s Justin Lindine was fourth in 3:21:05, and five-time defending marathon national champ and three-time Olympian Todd Wells of Durango was fifth in 3:22:48. McElveen took the jersey from Wells and will get to wear the stars and stripes at marathon-type events for the next year. That includes his next event, the Grand Junction Off-Road on May 19-21. It is the second of three stops on the Epic Rides lineup this season. 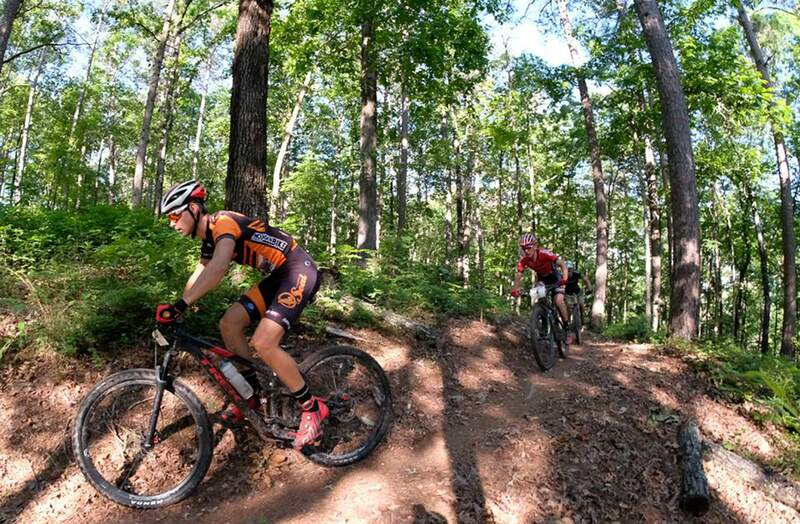 The course in Arkansas was mostly flat single-track with few climbs and plenty of sharp rocks. McElveen thought his chance at victory was over when he crashed into a creek halfway through the race. Bishop suffered a punctured tire toward the end, and Wells rode the final 22 miles alone after the other four riders jumped him on a climb and he had to take a stick out of his dérailleur. But McElveen caught up to Grotts, and the two took turns making pulls. Grotts attacked in the final climb, but it wasn’t long enough and steep enough of a grade for him to put in the kind of gap he’s capable of on a climb. McElveen came out of the climb on Grotts’ wheel, and McElveen knew he had the edge in the final 15 miles and an eventual sprint finish after completing numerous training rides with Grotts through the years. McElveen established leads of 5 to 10 seconds, and each time Grotts would bridge the gap. The two are always friendly and respectful on the course together, but, when it came down to the two of them, both went all out for the win. “He had to burn a good match to bridge back to me on the last pavement section,” McElveen said of Grotts. “It’s an interesting situation. Howie is my best bud, and it was interesting to be battling for the national title against him there. Grotts and McElveen, both 24, knew they had their work cut out for them against Bishop and Wells, both 41. After 25 miles, it was a group of five together out front. When they hit the biggest climb on the course, Wells knew he didn’t have the legs. Grotts, McElveen and Wells will all return to racing at the Grand Junction Off-Road along with several other big names from Durango, including Benjamin Sonntag. Grotts was second at the Whiskey Off-Road in Arizona and will take a sizable time lead in the overall standings into Grand Junction, as New Zealand’s Sam Gaze won’t compete in the full circuit after winning in Arizona. Kristian Hynek of the Czech Republic also won’t complete the series, and he was third behind Grotts in Arizona.